This week has been an off week for me with my writing and I attribute that to the weird hours we’ve been keeping. Matt’s schedule changed drastically resulting in him working overnights (going in around 6:00 in the evening and coming home as late as 4:00 a.m.). Feeling bad about the hours he is keeping and, of course, wanting to keep us on the same schedule as much as possible I’ve been trying to stay up until he gets home. Then we sleep until about 11:00 or noon, get up and run, go to the market, take a nap and then eat dinner. By the time I have a chance to write it’s about 7:00 p.m. and I’m not the best nighttime writer. So here’s my attempt at a second evening post this week. Yesterday dawned on rainy and cool, so after a quick run to get pork (replacing the pork chops that we somehow lost between the market and home the day before—don’t ask), we came home and snuggled up on the couch to watch movies. Our pick of the day? In Bruges. In Bruges tells the story of two hit men who travel to Bruges, Belgium to await orders from their boss. Ray, played by Colin Farrell, had a hit go wrong right before the trip and is struggling with his guilt. His partner, Ken (played by Brendan Gleeson), gets orders from their boss that force him into a struggle with his own conscience. The famous belfry tower in the distance. I won’t ruin the film, but it’s a well-written and well-shot dark comedy full of suspense and great Irish one-liners—and was filmed in—you guessed it—Bruges. Watching it brought back some great memories of our trip there in June, so it felt like a good time to reminisce and write about our own experiences (that did not, of course, include hookers, drugs and hit men). 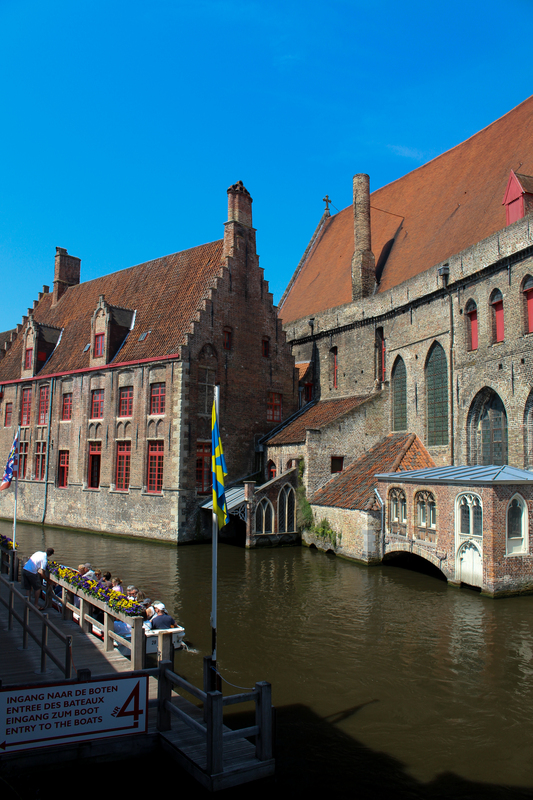 We booked our visit to Bruges through Viator as a day trip from Paris. Now if after reading this post you are headed to Paris and want to book your own trip, I’d recommend just taking the train and even staying overnight. 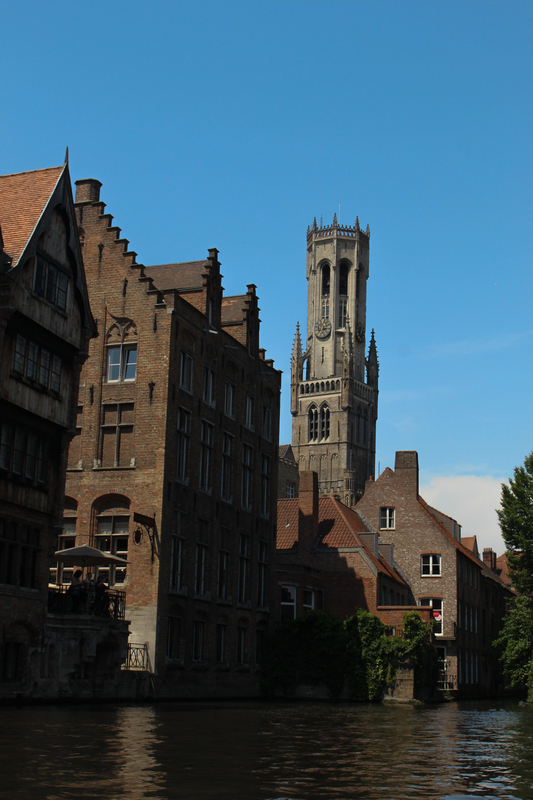 We spent more hours on the bus than we actually got to enjoy in this medieval fairytale town and our host had about as much enthusiasm about Bruges as Colin Farrell’s character in the aforementioned movie (that’s none for those of you who haven’t seen In Bruges yet). 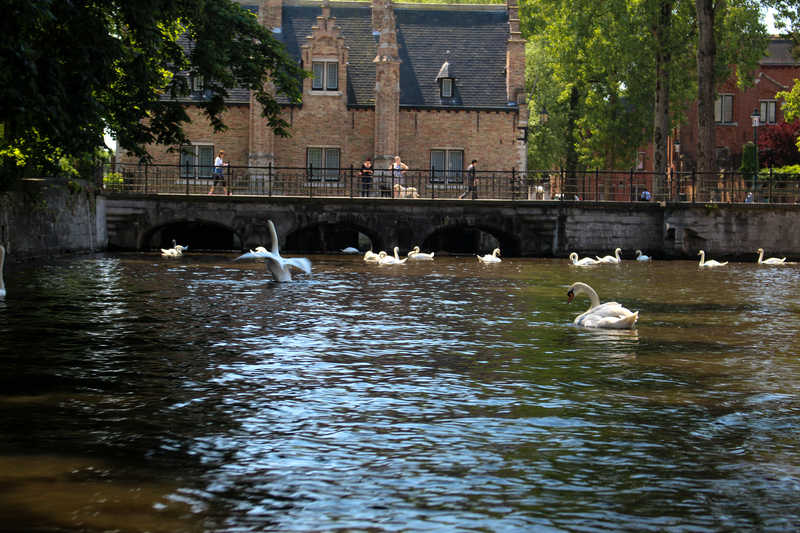 Bruges is a Flemish city and the capital of West Flanders in northwest Belgium. Between the 12th and 15th centuries it became an important trading center for Europe due to its proximity to the sea and canals. A canal runs through the center of the historic city center which is an UNESCO World Heritage Site and is comprised almost entirely of preserved medieval buildings, making it appear straight from a fairy tale. Some of the most famous buildings include the Church of Our Lady, which contains Michelangelo’s Madonna and Child and the Basilica of the Holy Blood (Sanguis Christy), which is said to contain a vial of blood from Jesus. The Church of Our Lady from the canal. 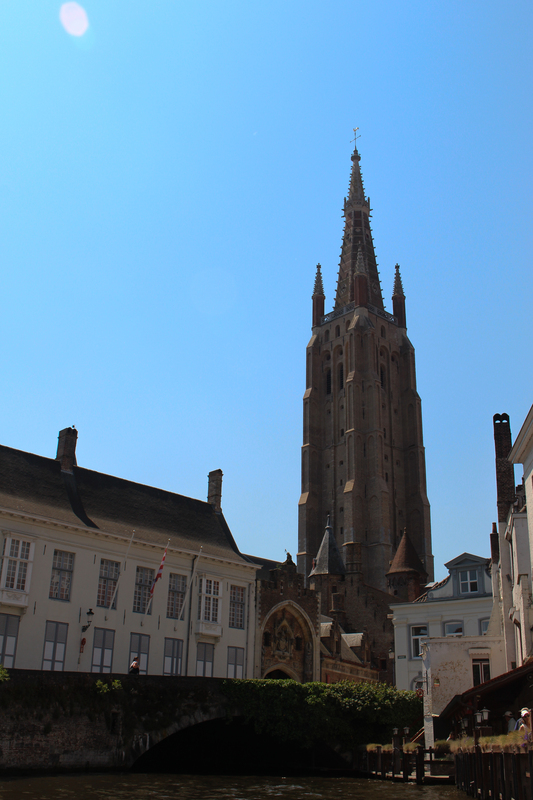 Many of the people we encountered in Bruges were multilingual, speaking English, French and/or German and Flemish, which made it easier to get around. I enjoyed seeing how much of the Flemish language I could understand based on my background in German as many of the words were similar, though spelled differently. Due to our limited time in the city and very specific priorities (1. Buy Belgian chocolate 2. Eat Belgian fries 3. 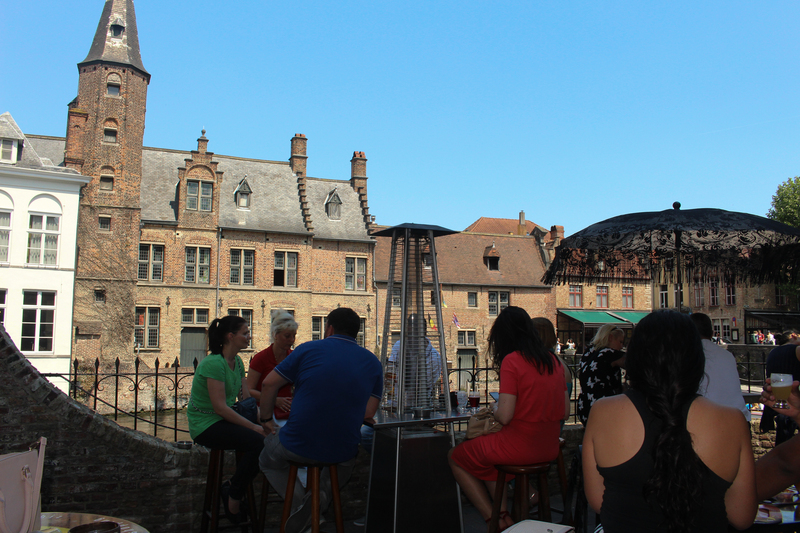 Drink Belgian beer), we didn’t have a chance to visit any of the historic buildings, but we were able to take a dreamy ride down the canal through town. 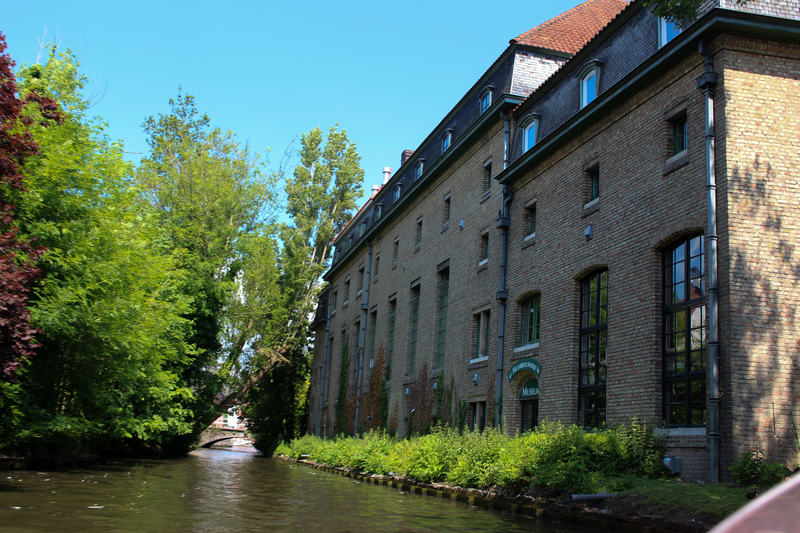 Our boat conductor (who was thankfully much more enthusiastic than our Viator guide) pointed out interesting sites including the city’s oldest building (dating, I believe, back to the 11th century), the De Halve Maan brewery and the infamous hotel used for the filming of In Bruges. 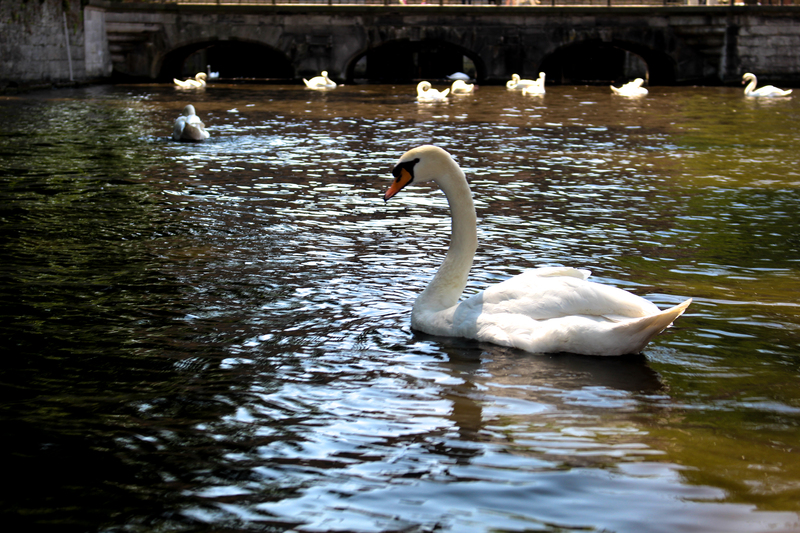 Swans gracefully floated by us as we drifted through the gorgeous city, adding to the fantastical experience. Look closely and you might see Colin Farrell jumping from the window! 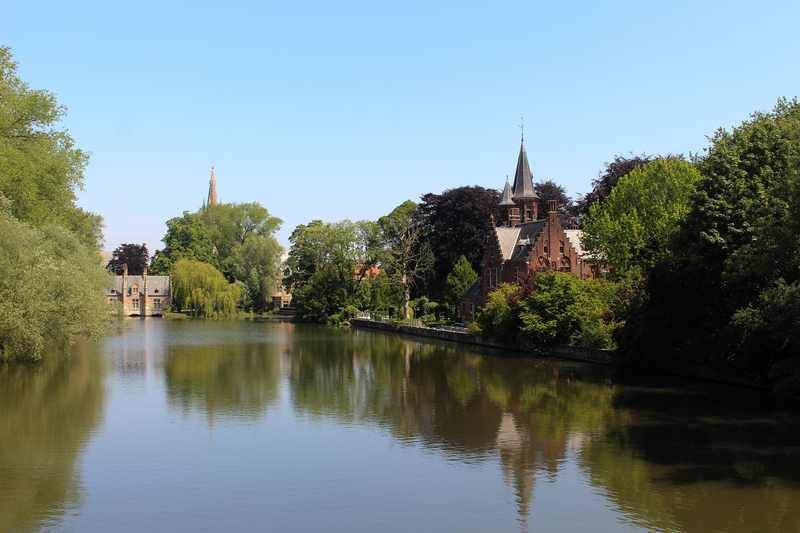 Once the 30-minute boat tour was over, we went on the hunt for lunch—which had to include Belgian fries. There’s an ongoing dispute about whether “French fries” originated in Belgium or France. 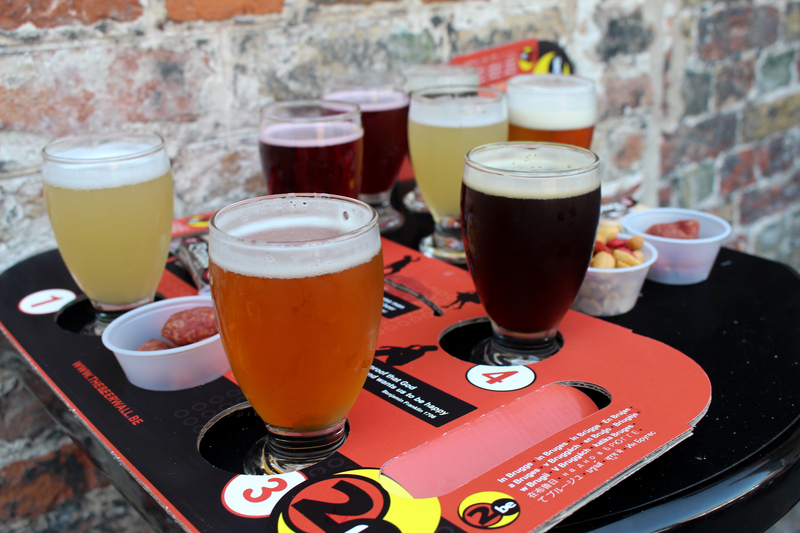 We couldn’t settle this debate, but we could attempt to determine whether the French or Belgians did them better. We ended up going to Arthie’s Bistro, a cute little restaurant decorated with bright and eclectic art, and sat under an umbrella on the little patio out back. 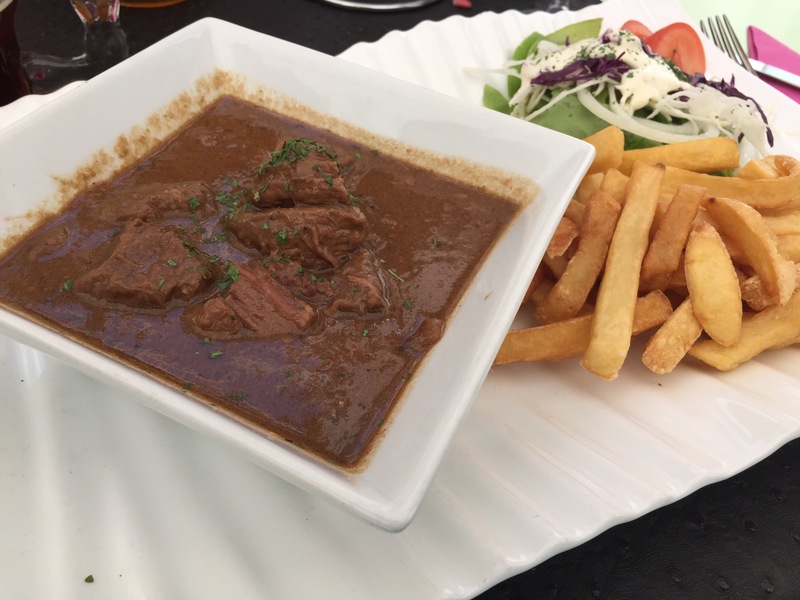 The day was incredibly hot, so it was hard to decide what to eat with our fries, but I ended up going for the Croque Monsieur (it seemed appropriate to determine if the French or Belgians did that dish better while I was at it) and Matt went for a traditional beef stew. 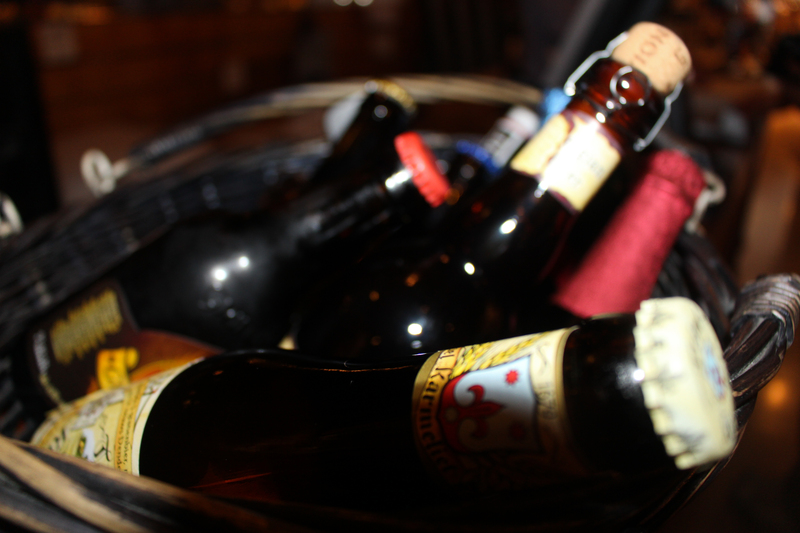 Of course, we also ordered Belgian beers to wash everything down. The Croque Monsieur ended up being more like a grilled ham and cheese sandwich that I would make at home and not as rich as the French versions—which was perfect for the day considering how hot it was. The stew was delightfully rich and savory and dipping the fries in it was a perfect combination. Oh, and the fries? They had a nice crisp, golden outside and were surprisingly light and airy on the inside (some pieces being mostly crust). They were much less salty than what we were used to from the U.S.
As to who cooks them better? Honestly, I think I need a few more tastings to decide—especially since we only had one experience with Belgian fries, though we’ve eaten fries in France multiple times over the past couple of months. Tummies full, we set off to find chocolate and cross another item off our list. 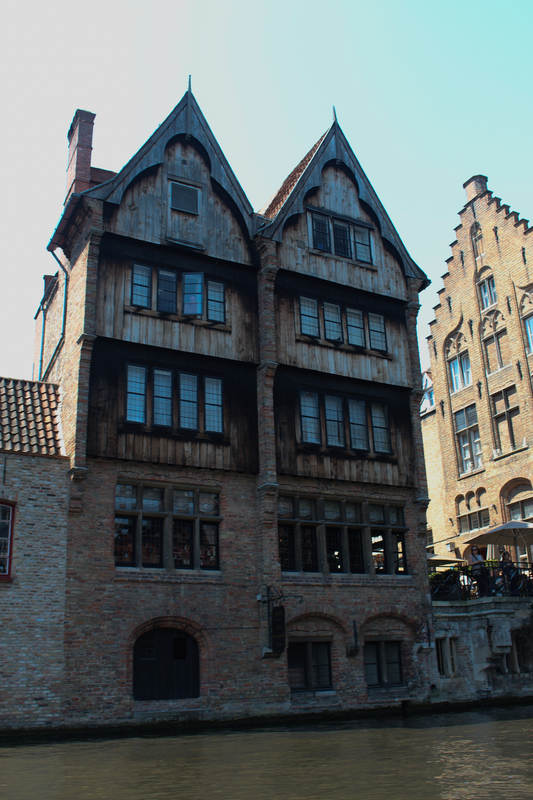 The chocolate shops are many in Bruges and their rich, sugary aromas all beckon you to come in as you pass. We ended up at Chocolatier Van Oost by Rudy T where we loaded up on at least a dozen small chocolates and a bottle of chocolate liqueur (which has become a favorite addition to my espresso). Though we held off eating any of the chocolates until we got back to Paris, they were all delicious and perfectly sized for emergency chocolate situations (ladies, you KNOW what I’m talking about). With just over an hour and a half to kill, we made a beeline to 2be Beer Wall to sample some more Belgian beers. 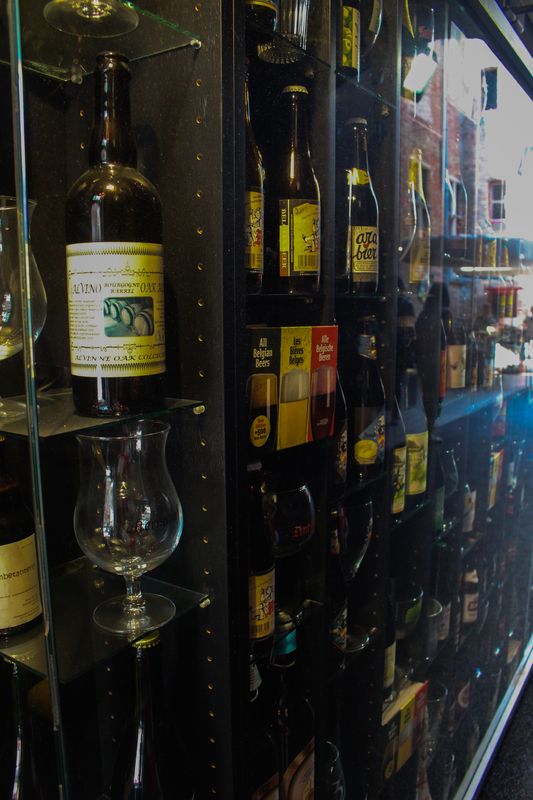 This relaxed bar greets you with a literal wall showcasing tons of different Belgian beers bottled in many different eras. The draft and bottle list was great as well and, because we had a hard time deciding what to order, we opted for a sampler which came with mini sausages, nuts and cheese! They know the way to this girl’s heart! We took our samplers and sat on the patio which was nicely shaded and had a beautiful view of the canal. It was here that I discovered I really like Lambic beers (the Kriek Boon Cherry tasted like biting in to the bitter, dark cherries I love) and fell in love with Mongozo Coconut, which is like a less-sweet version of a piña colada. 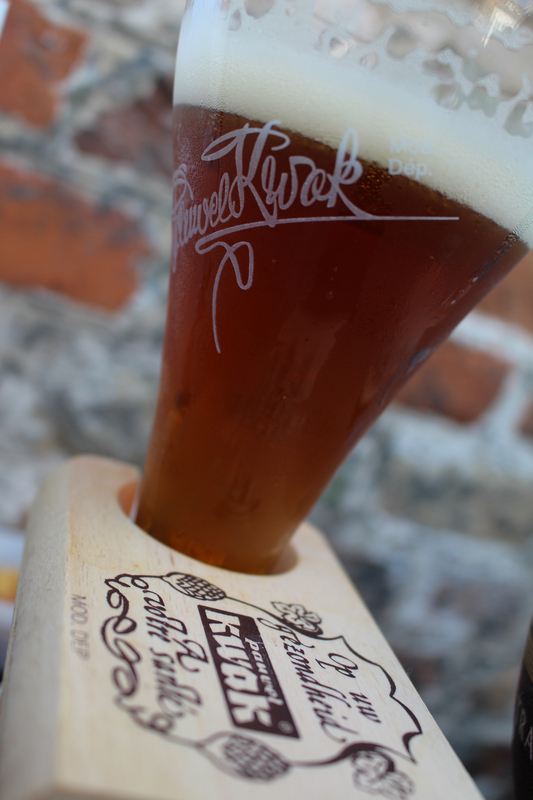 We also sampled the Kwak. (tee hee hee). Looking at our phones, we realized we had just a half an hour to run to the bottle shop, load up on a few beers to take back to Toulouse and make it back to our bus (we were forewarned by our tour guide that if we were even a minute late the bus would leave without us). So we booked it to the closest shop and quickly selected a few brews, sampled (and bought) a little whiskey and then practically sprinted back to the shuttle bus. We had negative minutes to spare and got on board just as the door was about to shut and the rain about to come down. We gave our host a sheepish shrug and, like rebellious teenagers, made our way to the rear of the bus where we could hide out away from the annoyed glare of our guide. 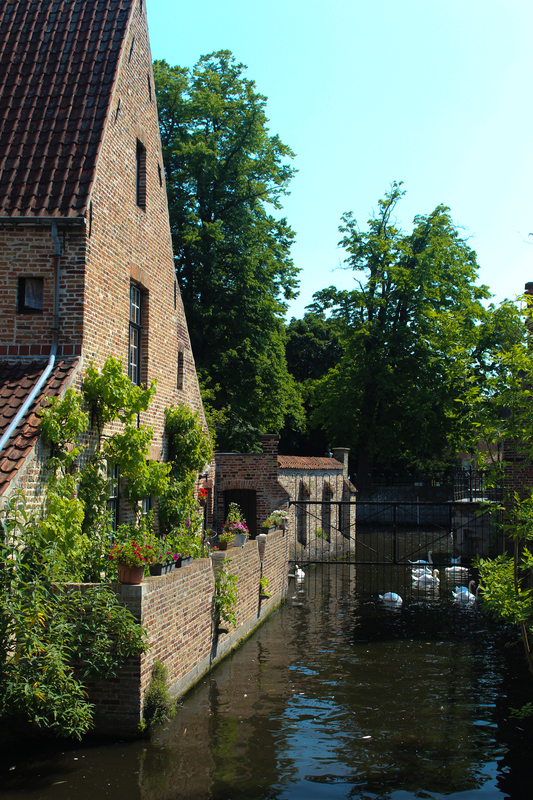 Bruges was incredible and a place we’ll definitely try to visit again before we leave Europe. If you have a chance, I highly recommend booking your own trip—just try to make it for longer than four hours. Once you see the fairy tale city for yourself, you’ll thank me. 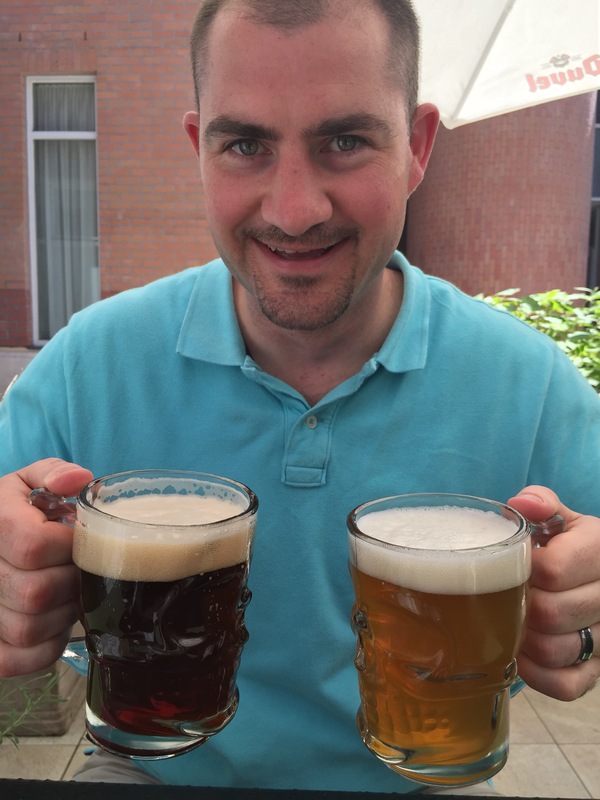 You forgot to mention that I hate Belgian beers, well, except when I’m in Belgium and have no choice!! I haven’t been to Brussels yet, so honestly can’t tell you, but Bruges is so beautiful that it would be worth spending a night there and seeing it all lit up after dark.